If the words “Sitting in a Tree” do not instantly remind you of your childhood, you might be one of the rare people to have been spared this classic playground taunt. 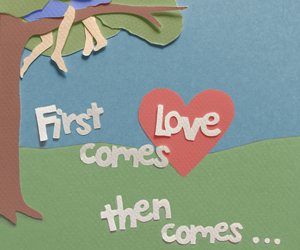 For many generations, children have been chanting this to embarrass anybody whom they suspect might be in love. They fill in the blanks below with the culprits’ names. That’s not all, that’s not all! Now the baby’s playing basket ball! That’s not all! That’s not all! Now the baby’s drinking alcohol! This image was created by cutting pieces of paper and carefully arranging and photographing them, which give it the hand-crafted “trompe l’oeil” effect — effortlessly! The DIY template you can download is formatted as a vertical 5″ by 7″ card with no text. It is centered on a letter sized sheet but you can print it on any A4 card stock as well, without cropping or scaling. Childhood trauma notwithstanding, it can be empowering to re-claim a taunt and turn it into a positive statement. Use this card to proudly announce your love, wedding plans, or even a new baby! 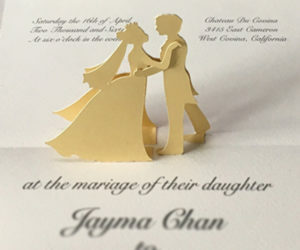 If you are planning on sending your announcement to numerous friends, DYI cards aren’t the best solution. 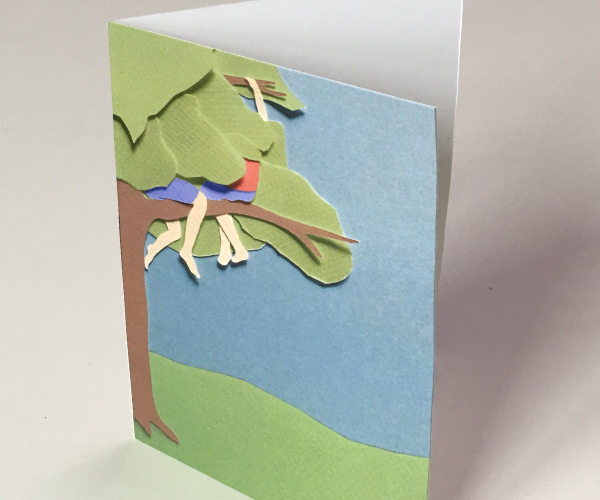 Cutting and folding one or two cards is fun, but making ten, twenty or hundreds of cards quickly becomes tedious. Plus the card stock which most home printers can use isn’t as thick and luxurious as the paper on professionally printed cards… so treat yourself and your friends! If you order prints in bulk you can customize the design to suit your needs. You can choose a vertical or horizontal orientation, include the text “First comes love then comes…” on the exterior, you can request specific text or even a pop-up design for the interior, and you can also adjust the skin tone. 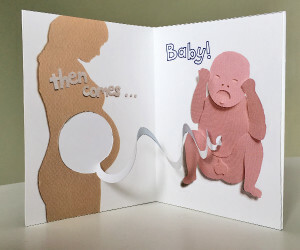 Below are samples of possible custom pop-ups: a bride and groom or any combination of newlyweds, or an infant baby with pop-up umbilical cord still attached (who can be visibly a boy, girl, or modestly diapered). 5" by 7" 3.5" by 7" 4.25" by 5.5"
Please make sure you entered your email address correctly.